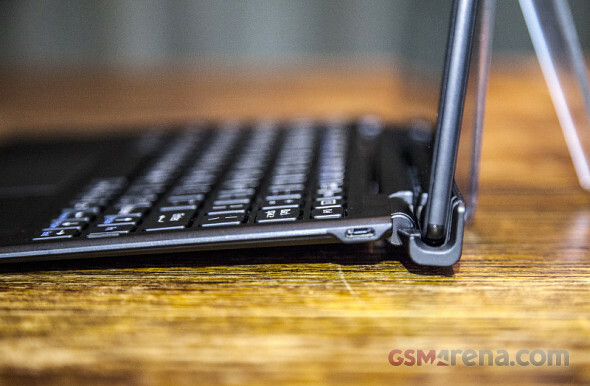 Sony brought a bunch of accessories as well, most notably a Bluetooth keyboard dock for the Xperia Z4 Tablet, which turns it into an Android ultrabook. A quirky wireless speaker was revealed too alongside a new wireless headset. Fans of wearables weren't left out either, and two more strap options for the SmartWatch 3 were released. The Xperia M4 Aqua doesn't skimp on connectivity options and comes with 2G/3G support as well as cat.4 LTE for download speeds up to 150Mbps. Retail price is quoted at 299 although that will obviously vary by market/carrier. Four color options will hit the shelves with a Silver on, in addition to the White, Black and Coral versions pictured below. Sony didn't stop there and showed some more interesting gadgets, among them the BSP60 Bluetooth speaker. When it's fully opened, it's reminiscent of a retro style alarm clock. It's not merely a speaker with a built-in amplifier which just pumps out what you feed to it, though. It's NFC-enabled and has its own display with 4 capacitive buttons to control volume and sift through its various functionalities. The device is more of a personal assistant, much like Amazon's Echo. An "OK, Speaker" command wakes it up and it pops out its motor-driven ears, ready to obey. The BSP60 can be asked to check notifications on your smartphone, which then can be displayed on it, or better yet, it can read them out loud to you. Simple tasks like setting up alarms and checking the weather are no hitch for the multi-functional speaker either. A handy _phone_ finder feature is also supported. The speaker is not all that small at 10cm in diameter and rather hefty at 349g. Interestingly enough that body houses a pair of wheels on the bottom, which will allow it to roll on flat surfaces, but unfortunately we didn't get to see it whizzing around the event floor. Audio enthusiasts on the move will be happy to hear of Sony's new SBH70 stereo Bluetooth headset. It features a behind-the-neck design to move the heft of batteries away from the ears. The earbuds themselves are an outer-ear type, so noise isolation is out of the question. The SmartWatch 3 is not a new product, but Sony chose to unveil a few more strap options. Even more stylish than the already released stainless steel version, the brown and black leather straps could help put the SmartWatch 3 on the wrists of not just us geeks. Sony Xperia E4g was introduced shortly before the MWC expo as an upgraded version of the original Xperia E4. It comes with a smaller 4.7" IPS screen of qHD resolution, better MediaTek MT6732 chip and LTE connectivity. The Xperia E4g went official just two weeks after the Xperia E4 announcement. While it cuts off some screen estate, the E4g model brings a more powerful MediaTek MT6732 chipset with a quad-core 1.5GHz Cortex-A53 processor, better Mali-T760MP2 GPU and 1GB of RAM. The highlight of the new Sony Xperia E4g was, of course, the support for 4G LTE connectivity on both the single and dual SIM versions. Sony Xperia E4g comes with 8GB expandable storage and 5MP rear shooter capable of 1080p video recording. 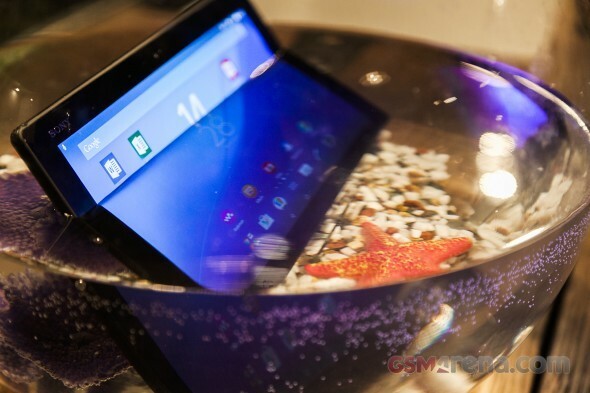 The Sony Xperia E4g was showcased at Sony's MWC booth and we've managed to grab a few shots with it. 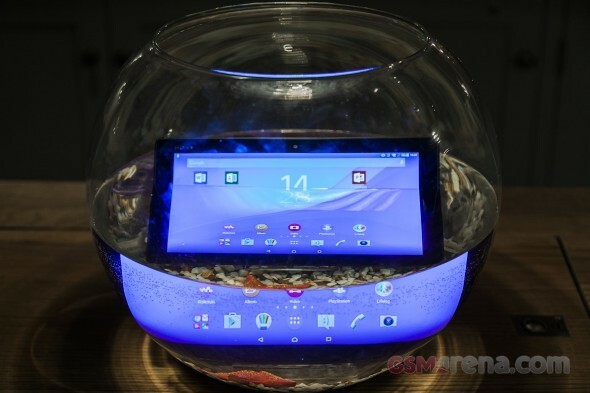 The compact fella may not be as interesting as the newly unveiled Xperia M4 Aqua and the Xperia Z4 Tablet, but it still looks like a quite a reasonable offer. 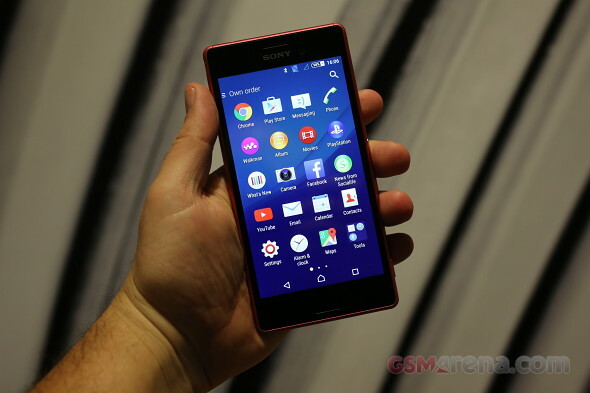 So, the Xperia E4g isn't the ordinary Xperia smartphones we are used to see. Instead, Sony decided to experiment a bit and change a few bits here and there to make it stand out. The result is a bit of a mixed-bag - you can surely recognize the Xperia E4g among other phones, it isn't because of its beauty and seamless design. Sony Xperia E4g's screen is budging a few millimeters above the rear cover and somewhat compromises the handling. The _phone_ indeed looks unique because of the much bigger rear cover the actual screen glass, but we are not sure this will be everyone's cup of tea. The all-black model definitely looks better than the white cover/black screen glass flavor. The rear panel is made out of two parts glued together and it is pretty obvious on the white cover, so this is yet another reason to opt for the pure black Sony Xperia E4g. The 4.7" IPS display offers above average image quality with nice colors and contrast, but not so hot viewing angles. The 64-bit quad-core processor handles really nice and the Android KitKat OS and the Xperia E4g offers buttery-smooth performance. The hardware upgrade will surely make for a nice difference over its predecessor. The Sony Xperia E4g is going to cost about 130, which means you can easily forgive the awkward design and the poor rear cover stitching in case you opt for the white paintjob.